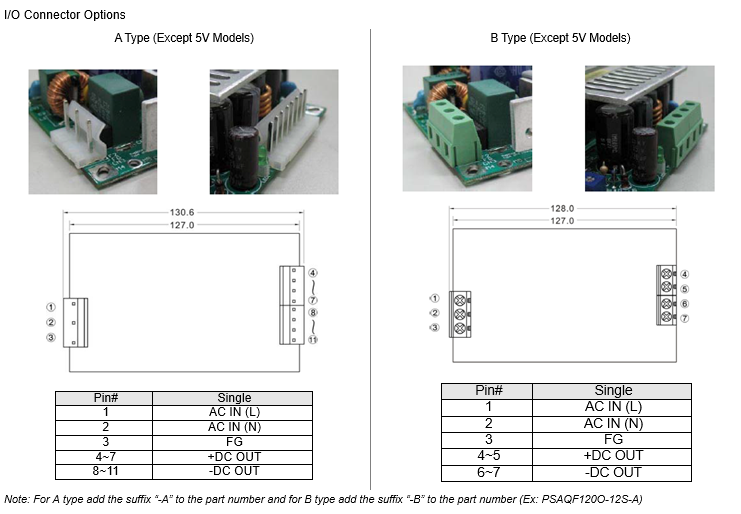 The PSAQF120 series of AC/DC switching power supplies offers up to 180W of output power with 18CFM fan for 12-48V output models, 150W of output power with 30CFM fan for 5V models, and up to 120W with free air convection. All models have a single output and a universal input. 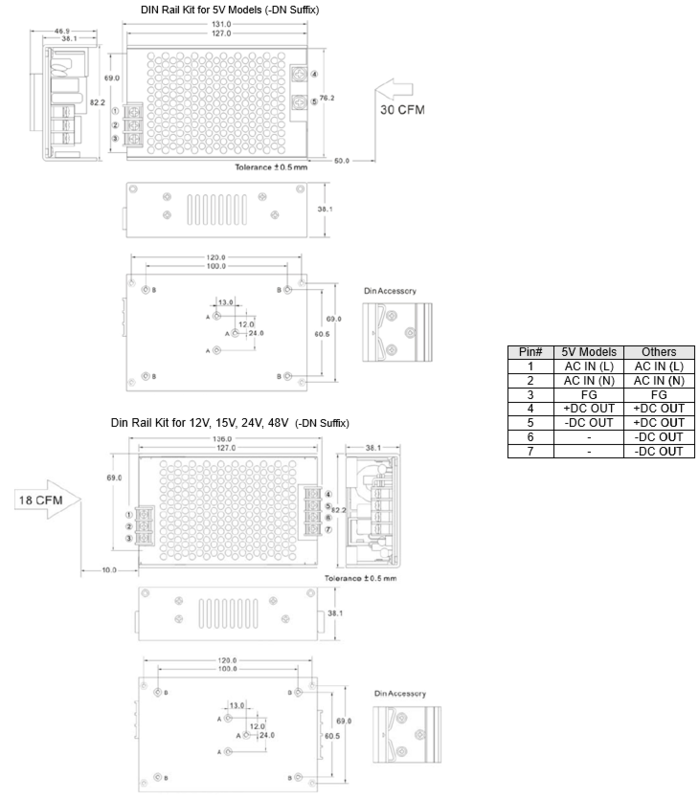 Some features include 4000VAC I/O isolation, PFC function, and efficiency up to 93%. 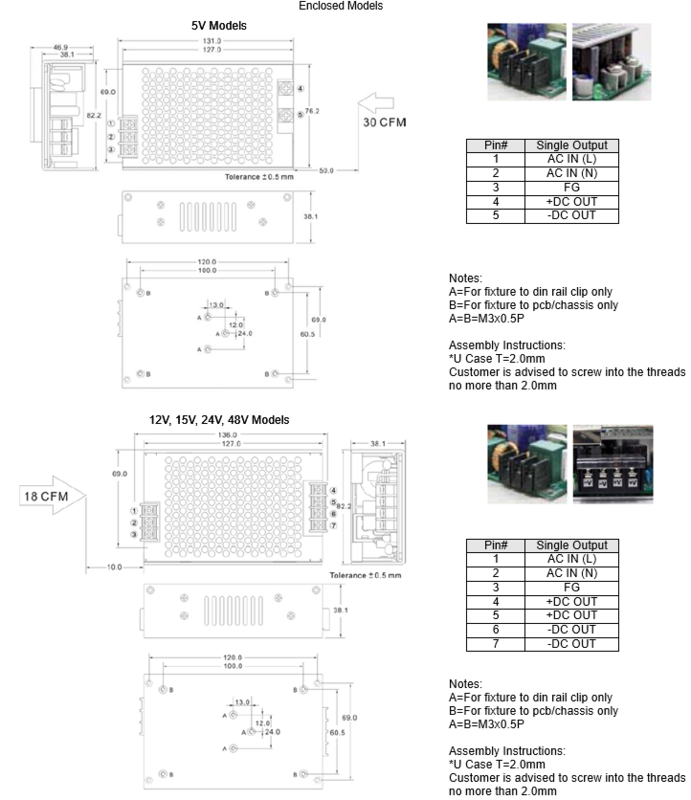 Each supply is also RoHS compliant and has CE safety approval and all models except 5V and 15V models have UL60950-1 and CB approvals. All models are protected against short circuit, over power, and over voltage conditions. 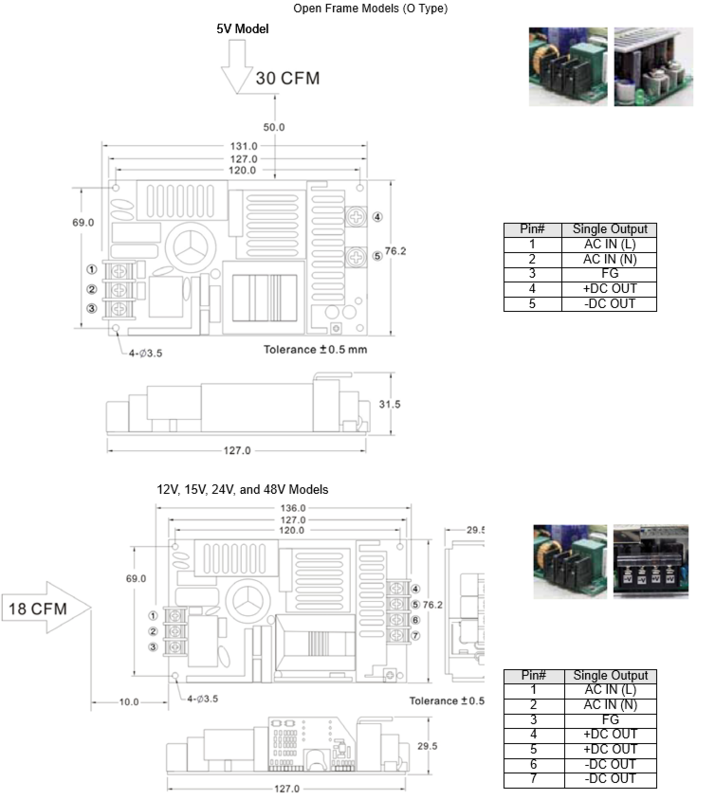 Models are available in open frame (Type O), U-Chassis (Type U), enclosed case (Type C), and DIN rail (-DN suffix for Enclosed Type) designs with two types of I/O connectors available. Please contact factory for order details. Notes: 1. 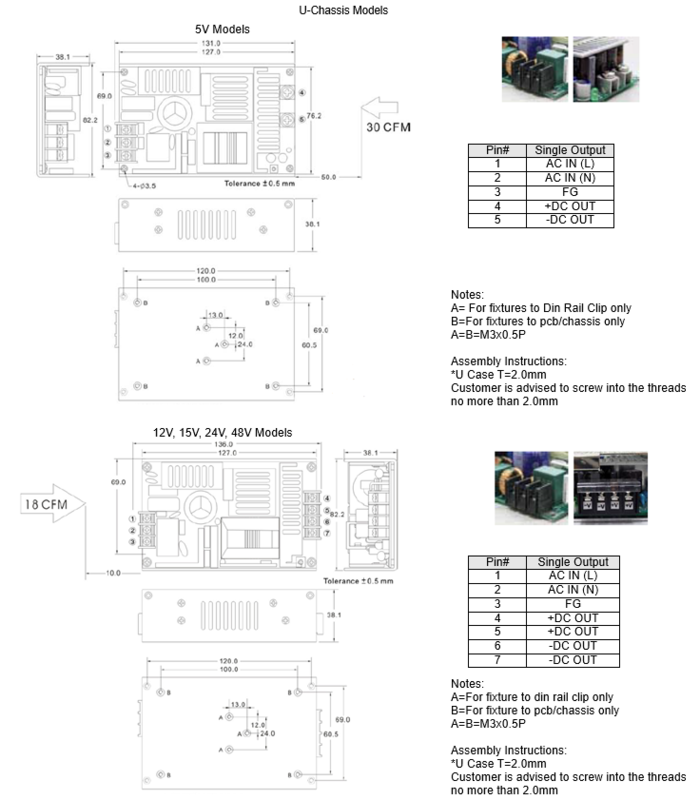 Optional I/O Connectors: For A type add the suffix “-A” to the part number and for B type add the suffix “-B” to the part number Ex: PSAQF120O-12S-A (See page 9). 2. 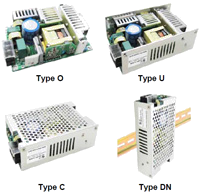 4 mechanical options available: open frame (Type O), U-Chassis (Type U), enclosed case (Type C), and DIN rail for enclosed models (to indicate DIN rail kit for Enclosed case, add DN to end of product model number. Ex: PSAQF120U-5SDN). 3. 30CFM Fan for 5V models, 18CFM fan for other models. 4. Ripple & Noise are measured at 20MHz of bandwidth with 0.1uF & 47uF parallel capacitor. 6. It is strongly recommended to conduct test with DC voltage. 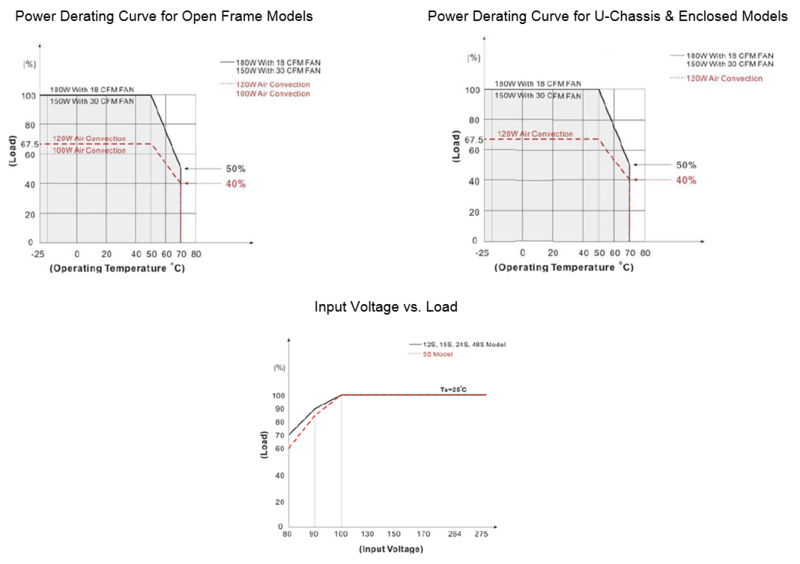 If customer wishes to test with AC voltage, disconnect all Y-capacitors within supply.